Durafoam Contoured Large Tire Dressing & Protectant Applicator Pad The Durafoam Contoured Applicator Pad works better than ever before! The all new Wonder Wave™ foam contour spreads tire shine and protective dressings deep into textured grooves, tread, and uneven surfaces found all over tires, seats, dashboards, and trim pieces. The unique laser-cut zig-zags act like soft squeegee blades to push dressings and protectants into every nook and cranny from every angle with each swipe. Use the Durafoam Dressing & Protectant Applicator Pad to spread tire shine on large nubbly off-road tires evenly without missing any spots. Pick the Durafoam Dressing & Protectant Applicator Pad to spread Leather Conditioner on leather seats and upholstery. Spread dressings over dashboards and door cards with no drips or mess with the Durafoam Dressing & Protectant Applicator Pad. The dense foam and unique Wonder Wave™ design hold spray dressings and creams on the applicator, and prevents messy drips and runs while spreading product over the surface evenly and efficiently. 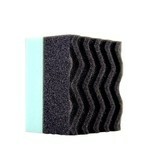 The dual foam applicator pad features a dense green handle for an easy grip over any surface. Choose the new Durafoam Contoured Large Tire Dressing & Protectant Applicator Pad with exclusive Wonder Wave™ technology to spread any dressing or protectant on any part of your vehicle. The Durafoam Contoured Large Tire Dressing & Protectant Applicator Pad is perfect for all exterior and interior dressing applications. Use the Dressing & Protectant Applicator Pad to spread tire shine on any type of off-road, street, or low-profile tire. The patented Wonder Waves™ help scrub and push dressing and protectant into textured grooves, tread, and contours. Simply spread dressing over the applicator, and scrub in both directions to work dressing into odd shapes for 100% coverage. 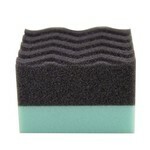 The dual-foam design pairs a stiff green foam handle with a durable black foam product spreader. Use the Contoured Dressing & Protectant Applicator Pad to spread tire shine on the face of faded and brown tires, New Look Trim Gel on chalky and faded bumper and mirror trim, premium water-based dressings on interior dashboards and door panels, or leather conditioner creams on leather seats and upholstery. 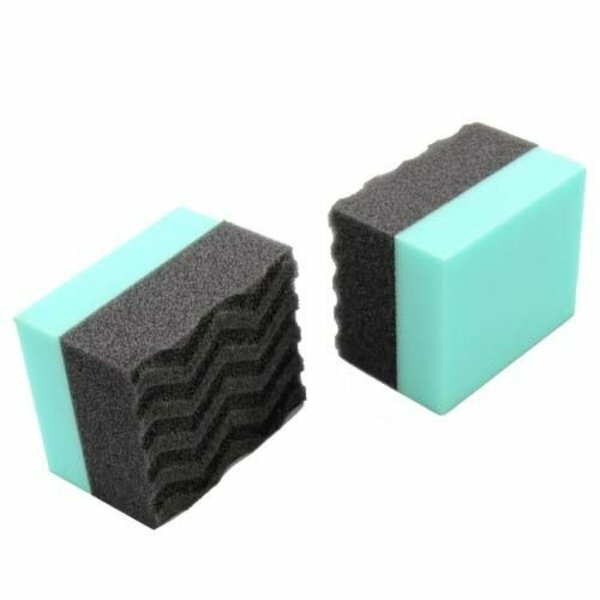 The soft foam applicator side is gentle on any surface and will not scratch, mar, or stain any vinyl, rubber, plastic, or leather. Choose the Durafoam Contoured Large Tire Dressing & Protectant Applicator Pad to dress and protect any interior or exterior parts. Vinyl, rubber, plastic, and leather are sensitive to harsh elements like extreme heat, UV sunlight, and liquid stains. Proper protection with premium Chemical Guys water and oil based dressings will help restore trim pieces and tires with a deep black shine, and help prevent future fading and degrading. Use the Durafoam Contoured Large Tire Dressing & Protectant Applicator Pad to spread a thin, even layer of your favorite Chemical Guys dressing on rubber tires, plastic trim, vinyl door panels, and leather upholstery. The unique Wonder Wave™ grooves push dressings into every nook and cranny for 100% even coverage over every surface. The Durafoam Contoured Large Tire Dressing & Protectant Applicator Pad is the first applicator pad with patented Wonder Wave™ dressing grooves. These laser-cut zig-zag grooves hold dressing on the pad, and help spread it deep into the surface of textured rubber tires, plastic bumpers, and even leather upholstery. 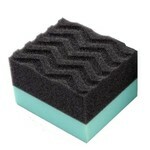 Normal foam applicators have smooth surfaces that cannot reach into nooks or crannies on textured rubber or plastic. The Durafoam Dressing & Protectant Applicator Pad uses the Wonder Wave™ design to push dressing into every peak and valley on every scrubbing pass for 100% even coverage. Spread a couple lines of your favorite Chemical Guys protectant into the grooves of the pad, then work it across the surface in straight lines back and forth, then up and down. Choose the exclusive Wonder Wave™ design of the Durafoam Contoured Large Tire Dressing & Protectant Applicator Pad to quickly spread protection coatings and dressings with ease on any surface. Even coverage helps ensure even protection, and even wear and tear of any protected surface. Without even coverage, surfaces can look spotty and uneven over time. Maintain the look and feel of any vinyl, rubber, plastic, and leather surface with premium Chemical Guys dressings and protectants, and ensure 100% even coverage with the Durafoam Contoured Large Tire Dressing & Protectant Applicator pad. Clean the surface with the appropriate cleaner or degreaser. Spread 2 - 3 lines of any Chemical Guys dressing, protectant, or conditioner along the Wonder Wave™ grooves on the Durafoam Contoured Large Tire Dressing & Protectant Applicator Pad. Spread the product over the surface, and work it in by scrubbing up and down, then side to side to ensure 100% even coverage. Wipe off any excess product to ensure a dry-to-the-touch feel.